From "hair rats" to butterfly clips, golden diadems to Afro picks, you could say women's hair accessories have always been our crowning glory. In November 2012, user Buggy1225 turned to babycenter.com's community board with a very pressing issue: She couldn't get her sock bun, the "little fucker," to look right. In a thread titled "Ugh stupid sock-bun! !," she vented that she had tried to give herself the en vogue hairstyle—which, if you don't remember, involved rolling your hair around a literal sock, like for your feet, to create a perfectly circular coiffure—50 different times, but each attempt left her with hair that looked like "Big Bird made a nest on [her] head." And in what may be the kindest forum board ever, her fellow moms chimed in—they understood the struggles of trying to wrap your hair around a sock in the name of fashion. We put some pretty unremarkable things on our heads—ponytail holders, bobby pins, barrettes. But for thousands of years we've also decorated our craniums with animal bones, pricelessly bejeweled crowns, and even knots of our own hair. While the logic of hair accessories is usually in service of conveying some wealth, status, or political position, sometimes it's just about making the best of all the beautiful dead cells attached to your skull. Long before a man shelled out $12.7 million for a diamond-and-emerald tiara that had once belonged to Princess Katharina Henckel von Donnersmarck, people were able to see the beauty in hair accessories made from exoskeletons and debris. According to Victoria Sherrow's Encyclopedia of Hair: A Cultural History, it's believed that the hairpin, the most fundamental of hair ornaments, dates back to prehistoric societies, where they were "simple, one-pronged sticks made from natural materials." For quite a while, natural was the trend: flower crowns in ancient Rome and Greece, feathers and bones in Native American headdresses, and beads and shells in ancient Africa. Basically, if you could find a way to keep a pretty thing you found on the ground in your hair, you had yourself an accessory. 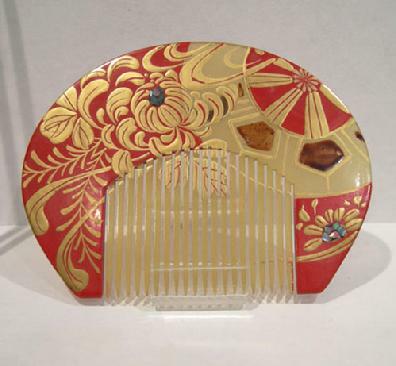 While Bronze Age Welsh women weren't calling up ancient Egyptians to inquire about their gold diadems or ogling over the jeweled, tortoiseshell kushi combs and kogai pins that women in Japan were sticking in their buns, most early civilizations independently realized the splendor of an accessory that is both functional and beautiful. Just last year, archaeologists discovered gold lock-rings in northeast Wales dating back to 1000-800 BCE, a time when coins didn't even exist, that they believe the fanciest ladies in all of Wales fastened around their hair to hold it out of their faces. According to Mistress of the House, Mistress of Heaven: Women in Ancient Egypt, women have been found buried with curved wooden combs that functioned as both ornament and, obviously, a comb in ancient Egyptian tombs at Deir el-Medina. Japan's Jōmon Period, from about 14,000 BCE to 300 BCE, was also when kanzashi, or traditional hair ornaments, started making their debut; initially, it was believed that wearing a single stick in one's hair could keep evil spirits away. If all this seems a little low maintenance for royalty, you're right. If you were, say, the daughter of a pharaoh, you wouldn't be wearing a comb in your hair—you'd likely sport an engraved gold diadem embedded with rare stones. Everyone knows that the best way to show off your parents' wealth is with a heavy gold crown. Women were putting cloth in their hair much earlier than the 1940s—Aztec and Mayan women braided fabrics into their hair, Incan women wore headbands (vincha) and headdresses from cumbi cloth, and women in 17th-century France matched their hair ribbons to their dresses. (And, of course, headscarves have played a vital role in many religions for centuries, from Orthodox Judaism to Catholicism to Islam.) But World War II marked a shift from the decorative to the utilitarian in America and Europe. In what can only be described as factory fashion, netted hair bags known as snoods—which originated in 16th-century Europe, had a brief moment of popularity in the the 1860s, and are now colloquially known as "hair nets"—hit their hippest point in the 1940s. According to Ethnic Dress in the United States: A Cultural Encyclopedia, "women who worked in industry found [snoods] practical for keeping long hair enclosed, while adding color and interest to a [their] wardrobe." There was also the timeless red bandana: Martha Washington popularized the headscarf in 18th-century America when she had her hubby's face printed on them, but today it's most closely associated with Rosie the Riveter's polka-dotted version. Women who wanted to return to the all-natural look of centuries past had options, too. These crafty types would often eschew fabrics altogether and wrap their locks around rats of their own hair; you could collect it from your hairbrushes and form it into rolls. Called, fittingly, "hair rats," these hairballs were a predecessor to the endlessly frustrating sock bun and served as the backbone for the ever-popular Victory Rolls. According to research from the University of Cambridge, the Afro comb dates back nearly 6,000 years to pre-Dynastic Egypt, but it wasn't until the 1970s that its visibility skyrocketed. Though the Afro hairstyle was never "out of style" in Africa, it became more popular in Civil Rights Era America as a declaration of black identity—and the Afro pick, commonly designed with a handle clenched in a fist of the Black Power salute, did, too. "The Afro hairstyle became very popular and for that you need a long kind of pick...it's quite high-maintenance," said Dr. Sally-Ann Ashton, the curator of the Fitzwilliam Museum's 2013 Afro comb exhibition, in an article in the BBC. 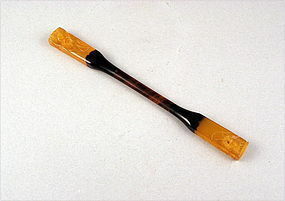 There were also claw clips in all sizes—small ones for the perfect half-pony or the hand-sized variety for at-home twisted updos—that promoted a Very Bad fake tortoiseshell pattern. But the pinnacle of painful plastic hairpieces—the one the most likely to poke your eye out—was scünci's stretchy comb headband, which looked like something the director of Teeth would've created (and was also available in tortoiseshell). "The bigger, the better" was the motto of the 80s, with its scrunchies and perms, but it wasn't until the aughts that women realized they could get volume without all the ammonium thioglycolate and teasing combs. In 2008, salon owner Kelly Fitzpatrick released the Bumpit, another scary-looking tool that promised volume so unnatural that Snooki wouldn't even try. 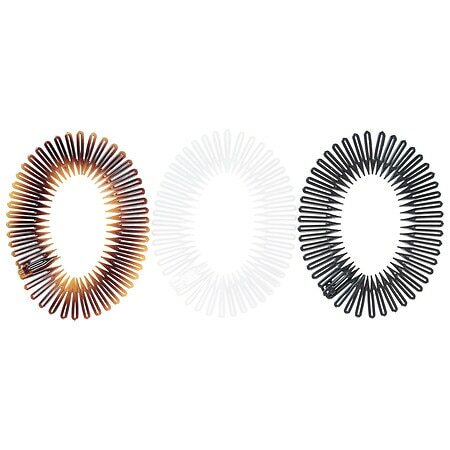 This decade also saw the rise of the slap bracelet–inspired Hairagami, as well as fake hair ponytail holders for the short-haired girls with long-hair envy. In the past few years, hair accessory use has declined—or simply become less obnoxious, as the trend has turned toward looking natural. Aside from Coachella-going white women weaving flowers into crowns and donning problematic headdresses, this translates to fewer decorative clips and more simple hairpins and ponytail holders. But those weary of wacky hair trends should perhaps hold that sigh of relief: Nearly four years since Buggy1225 turned to babycenter.com with her sock bun troubles, Sally Beauty, Conair, and H&M still sell specialty sponge rings and "bun makers." We may not be free of the bonds of butterfly clips yet.